More rainy days in Tampere but that does not matter if I'm inside sewing more cool stuff. Here's few pictures from Ateljeekatu of my products. Next time that I'll be at Ateljeekatu will be monday 16th of june. 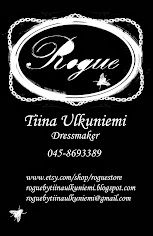 So if you want to come for a consult for a custom made outfit of accessories. And then new products again. Zipper beanies! 15 € + shipping a piece. Not too bad? Unicorn headbands. In my different colors. You can also request color. Black feather cross earrings. Also 15 € + shipping a piece. Can also be bought without the crosses. Little something I decided to make for me. If you are interested I can make one more that has the ball chain detail. I only have materials to make more without it. Fabric is satin cotton. Price: 36 € without the ball chain.